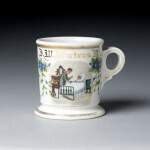 Shaving Mugs for Doctors are relatively rare, and I lump in Veterinarians because there just aren’t enough to justify two categories. 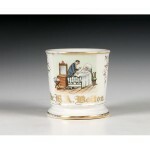 The traditional Doctor’s Occupational features an image of the doctor at the bedside of a sick patient, typically a woman, and taking her pulse or something similar. 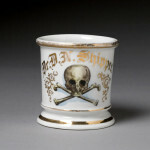 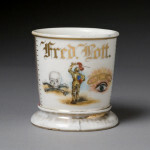 Other mugs feature the skull and crossbones as a symbol of the profession rather than having the “man-at-work” style mug. 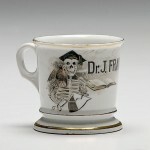 I’ve heard people say that the skull and crossbones mugs were sometimes listed as “comical” mugs, I can’t confirm or deny that one way or the other. 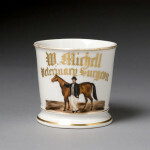 Veterinarian mugs typically show the man working with an animal, almost always a horse but some other animals can be found as well. 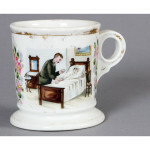 Doctor shaving mugs are rare and valuable, especially in good condition so feel free to send us a picture if you need help establishing the value or getting offers for your mug.